Transportation Costs > How Much Does a Forklift Cost? A forklift, also known as a fork truck or lift truck, is a powerful industrial truck used to transport goods. While this is most commonly used in a factory setting, it can be used elsewhere. Developed in the 1960s, the forklift has been a staple in warehouses across the globe. A forklift is the chief piece of equipment used to move pallets throughout a warehouse, and even the smallest forklifts are able to carry at least 3,000 pounds, while the largest can carry up to 30,000 pounds. The price of a forklift will depend on the capacity it can handle, the brand, features and where you purchase it. If buying brand new, a forklift can cost anywhere from as little as $15,000 to more than $100,000. Refer to our table below to see what the many types may cost. A standard 5,000-pound forklift that is commonly bought by warehouses and factories can cost anywhere from $15,000 to as much as $28,000. This type of forklift is more than enough to perform the jobs of the average factory. Internal combustion forklifts can cost anywhere from $14,000 to $35,000; the final price will be determined by the features that you want. A larger forklift, such as a 10,000-pound capacity forklift, can cost anywhere from $25,000 to as much as $50,000. Larger lifts that can carry more than 30,000 pounds can cost as much as $100,000. According to BuyerZone.com, a forklift can cost anywhere from $18,000 to as much as $100,000. The price range will all depend on the capacity of the forklift, the features that you choose, as well as the type of engine and power. Purchasing.com says the average forklift can cost a few thousand to tens of thousands, depending on the specific use. Toyota Forklifts says you should be prepared to spend $20,000 to $50,000 for most mid-sized forklifts. Not all forklifts will be manufactured by the same company. The better the quality, the better in terms of long-term value. A forklift will have two types of engines: electric or internal combustion. An electric engine will be powered by a lead-acid battery, and like an electric vehicle, it will need to be charged occasionally. Internal combustion engines will run on either propane or gas. Some forklifts will be designed to be used in specific situations. For example, some will be designed solely for indoor warehouse use, while others can be designed for working outside on rough terrain by using different tires. This is the maximum weight a forklift is able to handle, including the rider. The higher the load capacity, the more it’s going to cost. Like the load capacity, this is the highest point a forklift can reach. Typically, the higher the forklift can go, the less it will be able to lift. The load capacity will play a larger role when it comes to the pricing; however, the lift height can affect the price as well. Forklifts are rated depending on the amount of weight that they can lift. Forklifts will start at 3,000 pounds and can go as high as 30,000 pounds or more. The most common forklifts, however, come in 3,000, 5,000 and 8,000-pound capacities. Lift height capacities can range anywhere from 150 to 217 inches. The average side loader, which means the actual width of the forklift, is usually around 24 inches. This is an important factor to consider since the width of the aisles in a warehouse may be an issue. Common types of power sources can include gasoline, diesel, propane gas and electric, which uses a battery. Aside from the actual forklift, plan on setting aside $1,500 to $6,000 for the forklift battery and the charger. Like a car, the prices do not stop when you take it off the showroom floor. With a forklift, you are going to have to pay for additional costs such as the oil, the fuel, filters and regular maintenance. Maintenance alone can cost your business up to $2,000 a year, depending on the type of forklift purchased. Operating costs, as explained by business owners, will be in the $1 per hour range. Operating costs can range anywhere from $1,500 to as much as $13,000, depending on the forklift and how often the business uses it. Since all forklifts do not last forever, there may come a time when it will have to be repaired. Repairs can be costly, especially if something major goes wrong. 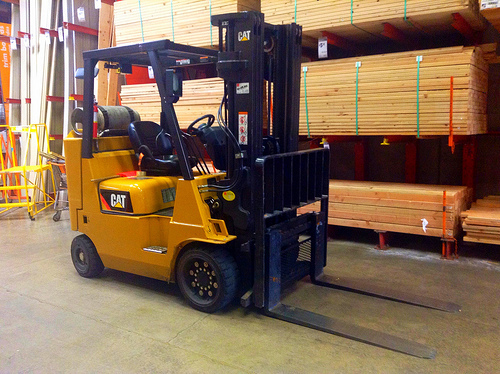 Just like a car, you will need to have the forklift, as well as employees running it, insured. If you plan on doing so, you will need to factor in the certificaiton/training costs if you wanted to train your employee. If you plan on using the forklift for more than four to six hours a day, many experts will warn you that a used purchase is not worth it. A new forklift will pay for itself in job efficiency. Electric forklifts can often take up to 15 hours to charge the battery. Used forklifts can save you more than 40% if you purchase from the right company. On average, a used forklift can start at $5,000 and go up from there. For those who do not have the money to pay in full, most dealers will offer financing options for just about any buyer that can qualify. Renting a forklift is also an option for those who only plan on using a forklift for a minimum amount of time. If your warehouse is located in an industrial complex, you can even consider sharing the cost of a forklift with a neighboring facility and splitting the time it is used. If you were to go this route, the average rental can cost $400 to $1,000 per month, depending on the type of forklift being rented.